Slimy syncretism slithers deeper into spiritually spineless evanjellyfish every day and Apprising Ministries continues to point it out for you wherever we find it. You just can’t make this stuff up. Think about it; who would have ever thought that Oneness Pentecostal heretic T.D. Jakes—a superstar in the corrupt camp of Word Faith properity preachers—would be mainstream. I just outlined his pitiful progression into the heart of the evangelical camp in T.D. Jakes Spiritual Father Of Paula White; and in Steven Furtick And T.D. Jakes you’ll see he’ll open the year for one of evangelicalism’s new darlings. 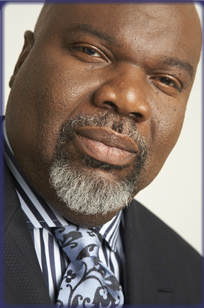 Now in these excerpts from the 9/1/11 edition of TBN’s Praise the Lord I’ll show you Oneness Pentecostal host “Bishop” T.D. Jakes in his natural habitat among his fellow Word Faith heretics. Watch for yourself as Jakes introduces three of his favorite WF pastrixes. Pastrix Paula White, whom Jakes calls “pastor extraordinaire” and Pastrix Cindy Trimm, recently given an award by The Billy Graham Evangelistic Association. The last is Pastrix Sheryl Brady of The Potter’s House North, whom T.D. Jakes called personally. As we consider that T.D. Jakes is becoming a mainstream evangelical, here now is a thought for the spiritually naive .